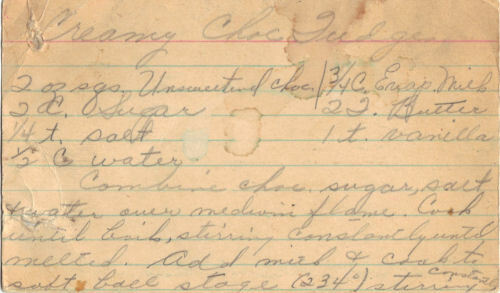 This same recipe is on two different index cards, one is quite aged and worn so it was likely transferred to a new card for easier reading. They were found in a large collection, date unknown. 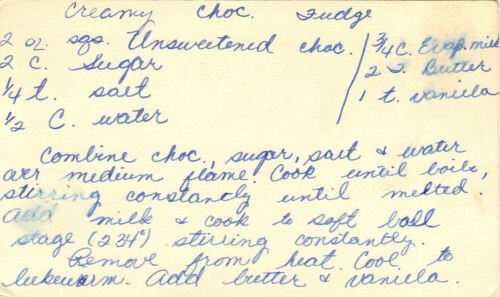 I’ve typed the recipe below along with a scanned copy of both cards. 2 oz. sqs. unsweetened choc. Combine choc., sugar, salt & water over medium flame. Cook until boils, stirring constantly until melted. Add milk & cook to soft ball stage (234°) stirring constantly. Remove from heat. Cool to lukewarm. Add butter & vanilla. Beat vigorously until thick & no longer glossy. Thank you for all these old recipes that bring back fond memories.